A 10-year-old disabled boy was made to prove he had a disability when an airline's administrative error put his flight in jeopardy, says his mother. Alex Johnson said she was "appalled" with the "humiliating" treatment her son received at Split Airport, Croatia, getting a Jet2 flight home on Tuesday. She said Jack, of Wigan, Greater Manchester, who has Duchenne muscular dystrophy, was "mortified". A spokesman for Jet2 said the firm was "extremely sorry". Jack is the son of former Wigan Warriors, London Broncos, Castleford Tigers and Salford City Reds rugby league player Andy Johnson. Mrs Johnson said Jack and the rest of the family made "great memories" in Croatia but the holiday was "ruined" when they tried to check in on their return flight home to Leeds-Bradford Airport. She said although there was no issue on the outbound flight, staff at Split Airport appeared to have no record of Jack's disability and two days' notice had been required to put a motorised scooter on the aircraft. Mrs Johnson said she was then asked in front of Jack: "Do you have proof your son is disabled?" She said she showed his blue badge in "disbelief". Almost two hours later the family were allowed on the return flight. "Jack doesn't like any fuss or made to feel different," she added. 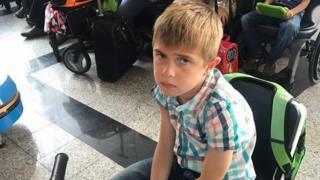 The following day Mrs Johnson said her son had a "complete meltdown", which she blames on the trauma at the airport. She said: "I want lessons to be learned and all staff to get training to ensure this never happens again to another disabled person. "They should be treated with dignity." Jet2 has apologised for the "distressing experience". "Although this is an isolated incident, we have learnt a number of lessons and are we are urgently reviewing all our procedures to ensure that this does not happen again."